I was very close to ripping out another mantel in our home, but had a last minute change of heart. Overall the mantel is very pretty and grand, but I was hating the faux painted marble look. Here is a picture of the mantel with the faux look, very dark and dreary. In it’s original state, I bet this mantel was a beauty, it looks likes one of a kind. I’m going to throw it a lifeline. Let’s slap some paint on it, and see how it turns out. The mantel has many grooves in it, making it difficult to paint with a brush. My painters taped off the area and took a spray gun to it. WOW! I must say I was impressed. The paint completely changed the look of the fireplace and brought it back to life. Goes to show how a little paint goes a long way in modernizing a fireplace, a room, or even a piece of furniture. To complete the look, we added a large Venetian mirror to the space above the fireplace. Never under estimate the power of a can of paint. I encourage you to take on a new painting job, and let me know how it goes…I would love to hear from you. Interested in this look? 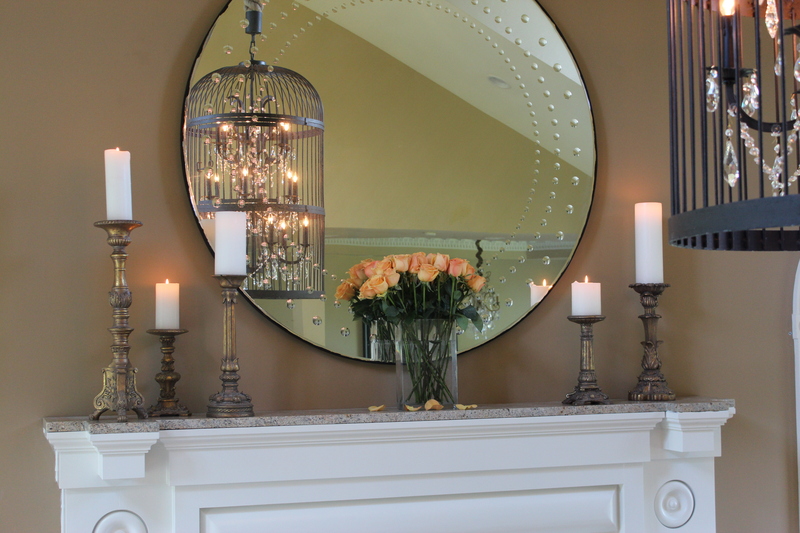 Do you love the birdcage chandelier? I absolutely love mine. You can check out this link for a similar one Birdcage Ceiling 12-Light Mini Chandelier (HERE). And the mirror is truly stunning! Are you looking for a smaller version, check out this one Round Gray Bubble Paned Mirror (HERE). Your white fireplace looks more pretty than the colour it was before. You had such a great idea of changing its colour to white. It looks smashing! Thank you! I love the white too, looks so bright! I am putting up a white christmas tree next to the fireplace and it does look smashing indeed! Thanks Barbara, so glad you found it helpful!